The boat from Penang to Medan, crossing the Strait of Malacca, takes six hours. It's fairly small, old but in good repair, and rather loud. The passenger deck is dark and crowded with seats, but only 10% full. It's refrigerated and drafty. We got invited upstairs to the pilot cabin ("kaptan") and could watch them navigate, and sit outside under a plastic tarp. The sea was choppy and the boat was rolling; some passengers were vomiting into plastic bags. I caught some sleep. USD 25 got us a 30-day visa to Indonesia. The visa officer was smiling brightly, good start. This is a Muslim country and muezzins can be heard calling to prayers in the city, but she wore no veil. The bus ride from the harbor to downtown takes very long; the roads are better than their reputation but packed with honking cars. 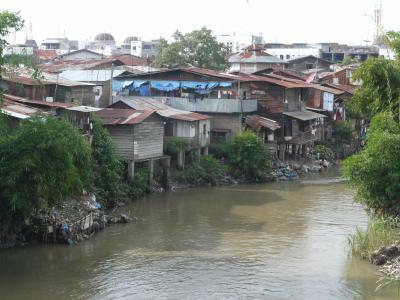 We passed a slum, and there is garbage in the water and at the roadside. Goodbye Malaysia. The weight of the mighty euro got us checked into Garuda Plaza Hotel, a top-end western hotel with all the amenities. One euro buys 14,000 Indonesian rupees, and one million rupees (about 67 euro) is the most one can get from an ATM; the double room cost 16 euro. Medan is not a major tourist hub and boasts exactly two important sights. 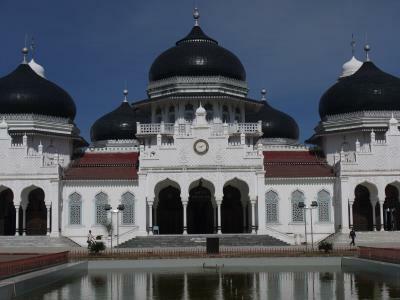 The Mesjid Raya mosque has impressive black domes, and a simple and elegant, although slightly worn, interior. People were sleeping on the carpets. To get in, we had to hide our shorts with sarongs available for tourists at the entrance. A very tenacious guide kept following us, and after deflecting all our attempts to send him away actually got angry when we refused to tip. Not a promising business model. According to the Lonely Planet, the Istana Maimoon palace is crumbling, but in 2009 it was in good repair. Only two halls were open to the public though. A group of people were being costumed as princes for photos, and a small boy perched on the nose of the seat was proudly circling the palace on a big motorcycle. Medan not only has the traffic-choked modern district with our hotel, but also a traffic-choked but otherwise pleasant upscale residential district called Polonia, with lots of trees, big mansions, and black SUVs; and a traffic-choked downtown with (possibly deliberately) neglected colonial architecture. The historical Tip Top restaurant had fantastic Sirsak juice, white but with a kind of strawberry taste. Like other cities before, Medan is considerably nicer when darkness cloaks the neglect. Haggled a becak (motorcycle taxi) to the hotel down from 50 to 15 kilorupees. Walked across the street to buy some water, and got pinned down at a juice stall by a thunderstorm with torrential rain. (Is rain always torrential in Indonesia?) Chatting with the boys running the booth and learned a lot of Indonesian phrases, but not what they mean, which limits the utility of my new skill. Danau Toba is a volcanic lake four hours southwest from Medan and 900 meters up, with an island called Tuk Tuk where all the good hotels are. 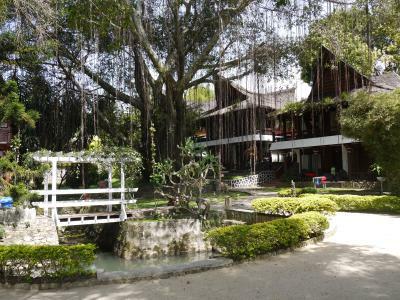 It's cool up there, and our hotel is a tranquil resort at the lakeshore with small huts built in the traditional style with steep swept gables, in a large tropical garden. The only thing to be heard here are birds singing, there is no traffic at all. Such a relief after the maelstrom called Medan. We'll stay three nights here, rather than rushing from one attraction to the next. Met a photo journalist on the bus who had just returned from Danang, where a strong earthquake struck last week. Apparently mostly the downtown highrises were affected, but the smaller houses where most people live were relatively undamaged. A lot of villages on the hillside have become victims of slides though. Also talked to Eric from Sydney who showed great pictures from northeast Borneo, maybe I'll go there when my Indonesian visa runs out. Right now I am not doing very much at all, other than writing my diary on a terrace of the Carolina Hotel overlooking the garden and the lake. 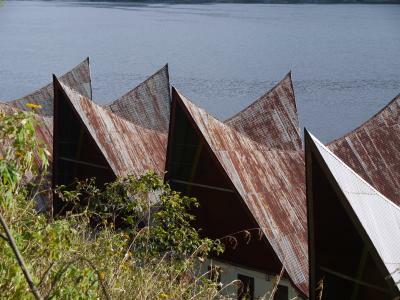 The Carolina Hotel is the main landmark of Danau Toba, many of the island's postcards are taken here. Didn't do very much at all. There isn't really a town on Tuk Tuk, just a long circular road around the peninsula we are on. It takes about 90 minutes to walk the loop. There are lots of small children playing, and they all want their picture taken, posing for the camera, jumping into the river for show, looking at the display and laughing. I gave the camera to one group and they started taking pictures of one another, and getting the hang of it pretty quickly. The water of the lake is warm, so we spent a while swimming as well. The lake is very deep but visibility is only a few meters. Rented bicycles to ride to Tomok a little south on the island, but it's basically a cluster of souvenir shops. The ride north to Simanindo was much more interesting. The road at first ran between the lakeshore and the mountains, through incredibly green fields and tiny villages, and grazing oxen led by ropes. Later the terrain turns hilly. 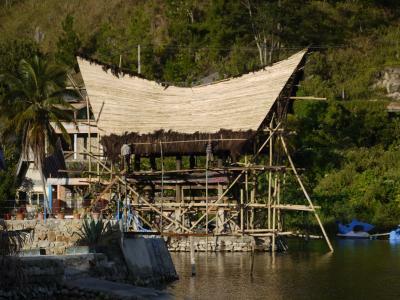 There are lots of churches and little Christian cemeteries - the Batak people who live on the island are mostly Christian - and older people whiling away their time in bars that scenically overlook the lake below. Everyone here is friendly, laid back, and not at all pushy. 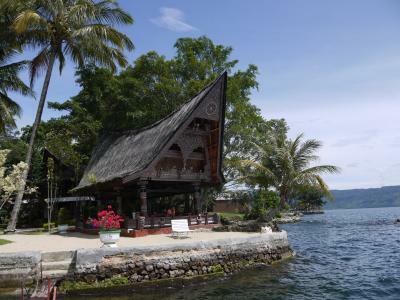 At Simanindo they have a Batak museum with over a dozen well-preserved historical Batak houses with the characteristic curved and pointed roofs that keep the walls in shadow, thatched with straw. Elsewhere the straw has often been replaced with corrugated metal streaked with rust, and modern houses no longer sit on wooden stilts but on concrete foundations. Overall we rode about 50km. Our Carolina hotel is certainly the nicest resort on the island we have seen, with the best lake access for swimming, but their WLAN access is incredibly unreliable. Mostly a travel day. Settled the hotel bill: 65 euro for two people, three nights, and all meals and juices. 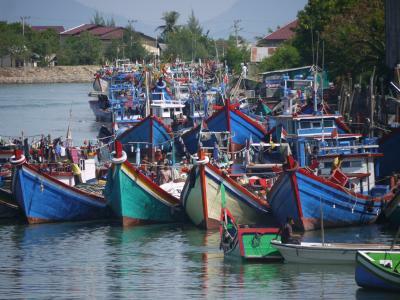 We used the ferry to Parapat, then a minibus to Medan, and a flight to Banda Aceh. There is a restaurant with a juice bar at the airport, but no matter what you order you get either orange or apple juice. They have bottled juice too; one list of ingredients says "100% pure sugar". The schedule displays showed a noisy Firefox connection error, and the gate displays said "no signal" so the flights were called out by an attendant. We first practiced the Four Skills in shallow water: breathing under water (NEVER hold your breath or your lungs explode), clearing regulators, recovering a lost regulator, and clearing masks. Also equalizing, which balances air pressure in your ears to keep them from exploding. 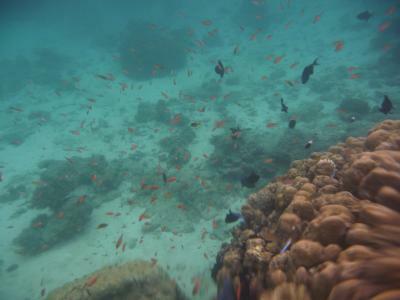 We then went diving in a reef not far from the beach, five meters down, and practiced diving maneuvers, watched fish and corals, including a gorgeous lion fish. The stingray was hiding. We later looked them up in a book. Diving is fantastic, we are trying to get another slot on their schedule. There is no beer on the island, officially. Sumatra is Islamic. 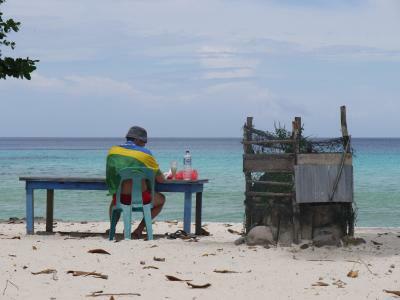 But they aren't too religious about Islam here so they smuggle beer to the beach, and store it in a separate refrigerator and list it on the menu as "B". A can of beer costs as much as a meal but it's not going to run out. Anyway, I digress. Did another dive with Jim, minus the theory this time. It was much easier this time to breathe to control depth, rather than getting oxygen, automatically without thinking, and overcorrection was almost gone. 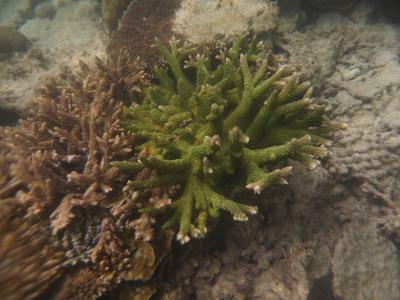 We had 45 minutes to float at a depth of 12 meters, watching corals and fish far more colorful and varied than the ones near the surface we saw when snorkeling. Jim pointed out clownfish (now called Nemos), spiny lionfish that look like they were flying dozens of flags, toadlike stonefish than change color to match the background, and long thin trumpetfish hanging heads down. It's great to watch the other divers floating in the blue water weightlessly, with streams of bubbles rising up. The surface is invisible. Everyone here is very open and friendly. People keep calling out to us, not because they want to sell something but because they are genuinely curious and would like to chat a little. We usually conclude after a few minutes that we don't share enough English, but that we enjoyed talking, so we say goodbye and smile and wave. Until the next chat. When we were ready to leave for the airport, it started raining and we didn't see a taxi, so some shopkeepers found one for us. The driver later stopped at the edge of the freeway to give us his name and number. It's all very pleasant and relaxing, I wish more of Asia would be like that. Airports are generally designed to be functional, not beautiful. In Banda Aceh they took a stab at beauty too and gave it three golden and green domes, and lightened up the departure hall with wooden ornaments. The checkin procedure was maximally easy, and the attendant, like everyone else, is happy, smiles a lot, and offers warm greetings. 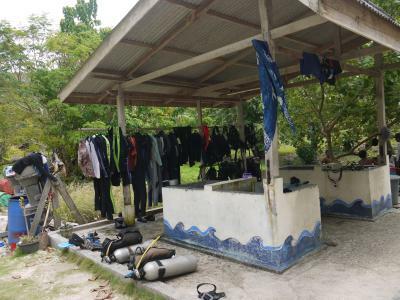 Anyone who thinks that Muslim countries are necessarily strict and cheerless places should visit Banda Aceh, and stay a little rather than rushing to the islands. 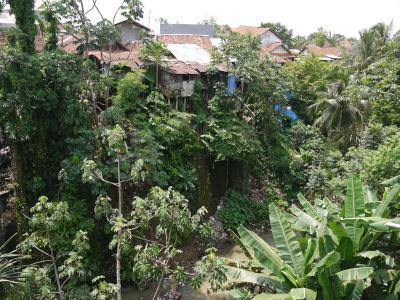 Bogor is a town south of Jakarta that is in grave danger of getting swallowed by its big neighbor. The train station spits out passengers directly into a shantytown bazaar made of poles, tarps, and corrugated metal; all very crowded and poorly lit. At the opposite edge of the bazaar, across a narrow street, is the Abu Pensione hotel with faded awnings and signs that lost the "i" at some point. Inside the rooms all face a nice little garden, and there are two terraces overlooking the river deep in a ravine. Bogor's heart is a huge botanical garden. Lots of trees and plants from many countries, a lake, an orchid house, and a zoological museum with lots of fading and dimly lit dioramas with stuffed animals. And a blue whale skeleton, not stuffed. A little like the government museum in Chennai. 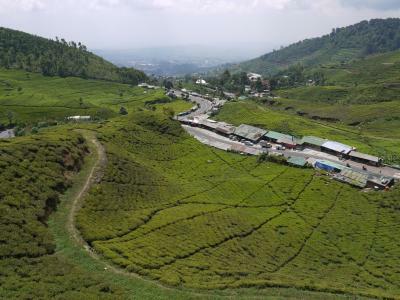 Puncak pass is at 1450 meters, 25km east of Bogor. The scenery is beautiful - lots of very green hills with tea plantations to both sides of the winding road. Unfortunately much of the scenery in hidden behind something like the world's biggest shantytown strip mall. Only the last few kilometers allow some views. 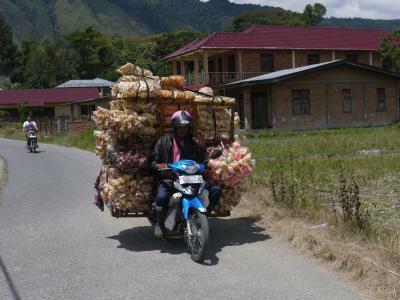 The bus to Cipana on the other side of the pass isn't so much a vehicle as a mobile vending cart. There are very very long stops, and a procession of street vendors parades through the bus, trying to sell water, fried things, bags with edible things, candy, nuts, watches, tissues, and other stuff. Some put stuff in your lap and collect it later if you don't want it. Three different groups of musicians pass through as well. The minibus back to the pass later offers a miniature version of this circus; the music is supplied by a big man with a karaoke box. The view from the terrace of the Rindu Alam Restaurant close to the summit is great. The fish is fantastic but extremely expensive: 3.50 euro for 500g. At home I'd pay that much just for the juice. Tried a new juice, Belimbing, very good. The nearby Telaga Warna, the Lake of Many Colors, is in a great peaceful setting that is more than worth the admission, although the many colors are all slightly different shades of greenish brown depending on the direction of the sun. There are bright green tea plantations all around. Spent 15 hours in buses. 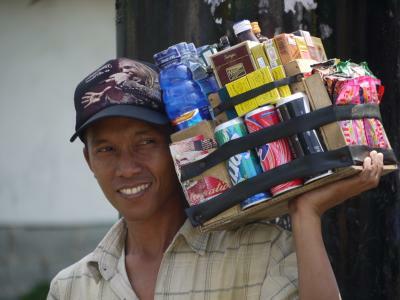 People here work with numbers loosely - eight hours become twelve, and 5,000 Rp is the same as 50,000 except when paying. And we spent over two hours just leaving Bandung's downtown gridlock. And the bus from Bogor to Bandung decided to flit by Jakarta. Arrived in Yogyakarta - or Jogja as people call it here - after midnight. But the scenery of Central Java was great, even better than on Puncak pass. 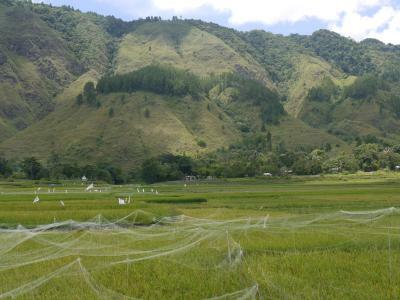 Many green hills, tea plantations, rice fields, and scenically placed straw huts and little villages. Except for the last two hours or so the two-lane road was snaking up and down the hills with hardly a straight stretch - children were retching into plastic bags helpfully hanging from the roof all around me. I only wish that I could have done only the middle five hours. I have very few photos, unfortunately. 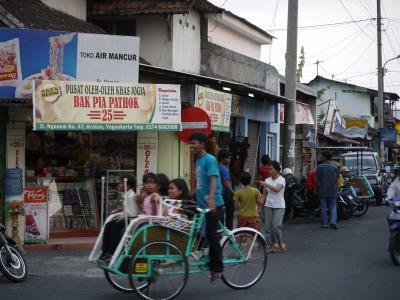 Yogyakarta's main street is Jalan Malioboro, a busy road with separate rickshaw lanes. It's one long shopping mall with clothes stalls in narrow dark arcades. It ends at the sultan's palace. The sultan lives there but a cluster of very large reception pavilions and smaller attached buildings that house exhibits can be visited. The central reception pavilion has an original beautiful wooden ceiling; all the other pavilions were lovingly fitted with flat pale green plastic ceilings with fluorescent lights and loudspeakers. Well done guys. The overall impression is rather lame. The rest of the surrounding kraton, meaning walled city, is rather nice, with alleys not shown on any map, lined with trees and small residential houses where children play and adults nap under tree shades. There are almost no cars there. 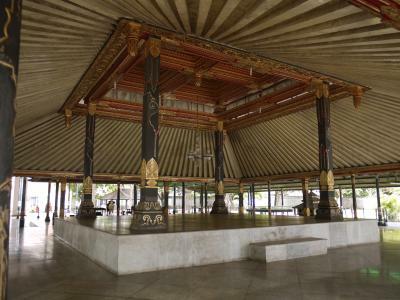 The whole kraton reminds me of Hué in Vietnam, except they have a much bigger and more beautiful palace. 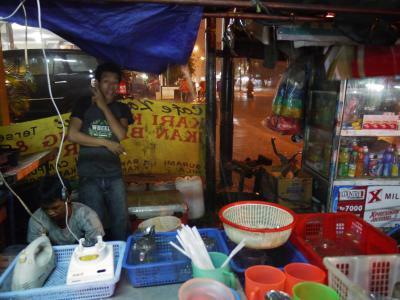 The Prawirotaman neighborhood to the southeast of the kraton is very similar, except that many backpacker facilities like restaurants with "international menus" (that means pizza and spaghetti) are here. 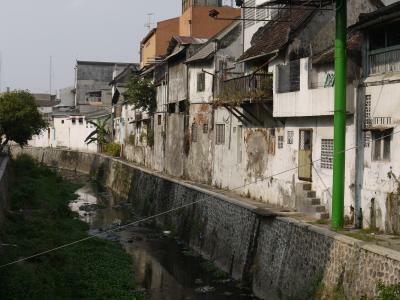 The water palace neighborhood is different; the alleys here are narrow and twisty and people live in low wooden buildings open to the alley. Definitely no pizza here. Children call out, and I talked to a friendly local about life there. When I asked if he needs to leave as the muezzin called out for prayers, he said no problem, he is an atheist, although his ID card says "muslim" because otherwise he'd be branded as a communist and that's very very bad. Rickshaws have two advantages: they are apparently not bound by any pesky traffic law at all, and while you are in one, you won't be hailed every 30 seconds by other rickshaw drivers. In Asia, you don't hail taxis, taxis hail you. All the time. 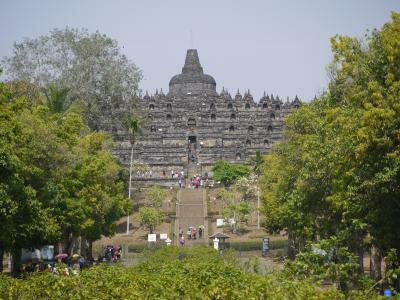 Went on the back of a motorcycle to Borobudur, a large Buddhist temple in a forest before a backdrop of green hills. It's a square of 120 meters at the base, with four square terraces topped by three round ones. The four square ones are walkways with very intricately carved panels on both sides, topped with (often headless) buddhas. The panels at the bottom show everyday life: people working, learning, dancers, houses, ships, animals, and a frieze of what looks like winged platypuses linked head to tail. Higher terraces show spiritual scenes. My crude estimate is some 10,000 people in deep relief, with millimeter detail but sometimes somewhat eroded. The floors look like a frozen tetris puzzle of carefully fitted pieces. There are two million blocks total, precisely fitted without mortar. 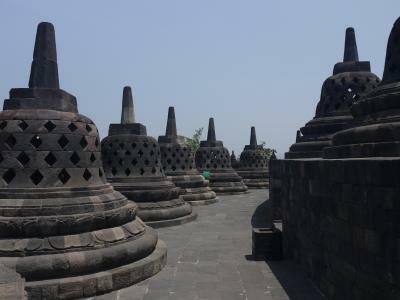 The round terraces have no carved panels, just 72 stupas with buddhas inside. You can reach in and touch the buddha, people believe it's good luck. Everything is crowned by a large central stupa. Much of the there time I didn't see any tourists because they all rush to the top, snap some pictures, and rush back down. Fools. The whole thing feels like walking a giant mandala (a picture of the buddhist world). Except that all mandalas I have seen lack tourists with gaudy parasols and guides with megaphones. I bet that when devout buddhists, after accumulating virtue on the wheel of incarnations, finally have their ticket stamped for nirvana, they'll get there and find chirpy tourists snapping pictures of them with cell phones. Bummer. 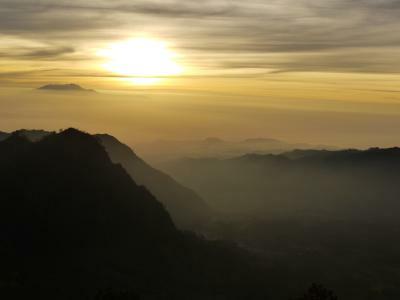 We continued to Magelang, a village and mountain pass with a vista point from which the Mt. Fuji-like Merapi volcano can be seen in all its glory. 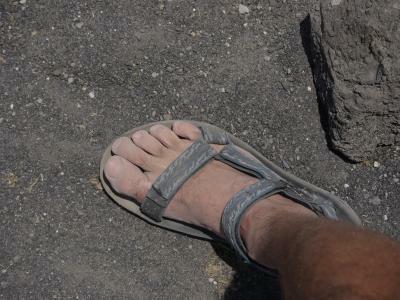 The volcano last erupted in 2006, sending lava down the slope and through a few villages. The panorama is beautiful, and so is the road there through rice fields and villages. Prambanan is a Hindu temple complex of enormous 7th-century stupas on a large terrace, dedicated to Brahma, Shiva, and Vishnu. It's a Unesco World Heritage site and under extensive restoration; one stupa is all scaffolded and several are closed to visitors. The stonemasons are clinking away on the stupas and on the ground to prepare large stones. They are nearly done in the central complex. Saw a worker free-climb one of the stupas, he looked like a small white dot on the massive structure. 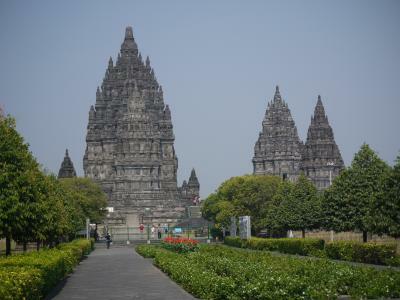 Prambanan is not as grand as Angkor Wat in Cambodia but gives a similar feeling of ancient majesty. Solo, aka Surakarta, is a small version of Yogyakarta, a nice working town with few tourist sights (and most of those, like the Kraton and the Pura, were closed). It's very relaxing that nobody wants to drag you into their batik galleries here and the rickshaw touts are too sleepy to annoy you all the time. Met a guy at a food stall who works as an English tutor. We talked for quite a while about life in Indonesia and Europe, and he invited me to join one of his lessons. We went to a fancy house with a large terrace, garden, and iron fence close to downtown Solo, where two earnest but shy boys, and later a university student, joined us for the lesson. It's mostly about talking because English teaching at schools is very formal, but also about TOEFL worksheets. 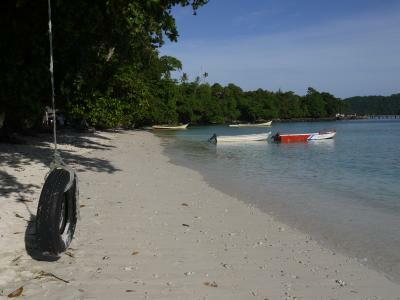 Everyone here wants to travel but the relative cost to leave Indonesia is very high. Then my teacher friend and the student joined the English tutor gang at a street food stall where they often hang out at night, and they invited me along. We had great discussions, sitting on mats and sipping tea for many hours until after midnight. One of them sails on cruise ships to the Bahamas, and another is a professor who worked for two years as a waiter in the US. I loved it, getting to know people is time much better spent than checking off yet another temple from a list! 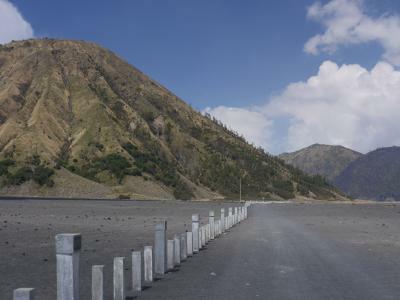 The bus from Solo to Gunung Bromo National Park takes ten hours, plus a change of buses in Probolinggo. It's basically ten solid hours of risky passing maneuvers. The road is in excellent condition but has only two lanes, and there are many trucks that crawl along at 30 km/h. So long lines form, and the driver whose patience runs out first - often a big bus - will turn into oncoming traffic and cut back into some small gap in the line just before a head-on collision becomes inevitable. It's a game of chicken played with flashing headlights. And a large number of motorcycles swarm through little gaps like angry hornets. Saw a big truck laying on its side, still loaded with motorcycles. For the first time since arriving in Singapore three weeks ago, I sleep in absolute silence. I woke up in my bungalow the next morning with a view of the Gunung Bromo. This is a small volcano in the middle of a vast crater ten kilometers across, and my bungalow is just meters from the edge of the caldera. There is a road from the hotel to the bottom of the crater. It's the world's biggest ashtray, filled with dark gray sand and a few sparse patches of brown grass. 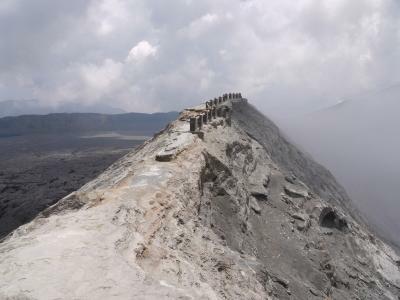 Gunung Bromo is an ash-gray mountain with its top blown off. A steep path, and then a stairway, lead up to the rim of its crater. Bromo's crater is a few hundred meters across, and looks exactly like a crater is supposed to look like: crevices run down the sides to the bottom of the bowl, where craggy canyons can be seen through the mist. 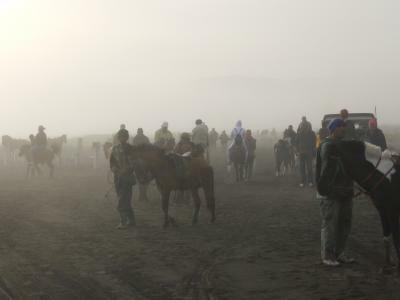 Gunung Bromo is an active volcano, and alternates between a single wisp of steam rising from the canyons, and eruptions of steam that fill the crater with gray fog slightly tinged with yellow before it rises up in a big cloud like from a smoke stack. A strong smell of sulphur wafts up like memories of highschool chemistry classes. There is no lava. 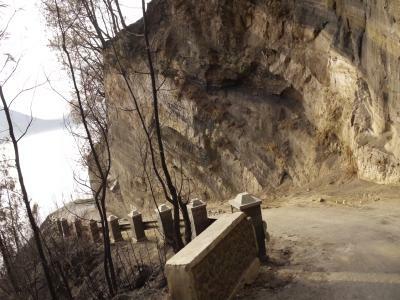 It's possible to walk around the rim but the path is very narrow between steep slopes, and the crumbling ash makes it unsafe. Since I had no urgent desire to fall into an active volcano I went back down the fractured gray lunar landscape to the bottom. A jeep picked me up at 3:45 to take me to the top of Mt. 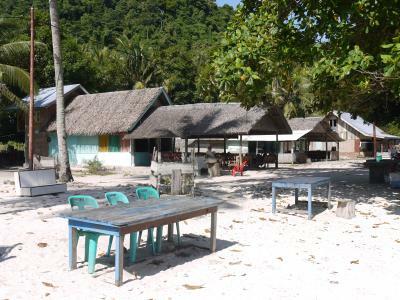 Penanjakan. The view of the sunrise is fantastic there. 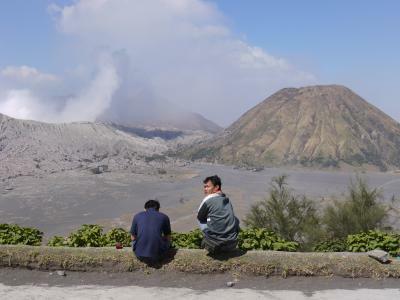 Much of the large crater with the Bromo volcano in the middle and its white plume are spread out before us. The bottom of the crater is with a sea of fog from which the volcano and a few other peaks rise. There are maybe 50 other jeeps and vans parked there, and the viewpoint platform is packed with other tourists, who enthusiastically take snapshots of the sunrise with a lightning storm of flashes. On the way down up I couldn't see much because of the fog and the dust, but the return trip revealed just how steep, deeply rutted, and close to the edge of the cliff the road up Penanjakan is. The jeep trip passes the volcano so I paid it another visit. I didn't have it to myself like the day before though; hundreds of tourists had the same idea and lots of guides with horses were expecting them. A long caravan of tourists trundled up the path to the volcano's crater rim. Because of the fog and dim yellow sun, the scene had a slightly surreal Lawrence of Arabia feel. Took a minibus to Probolinggo, then another to Ijen, then yet another because the previous one broke down. The distance is small but takes six hours anyway because when the road reaches the mountains, the road is more potholes than asphalt, and big trucks very slowly crawl up the mountain, sometimes two side by side, passing at 5 km/h. 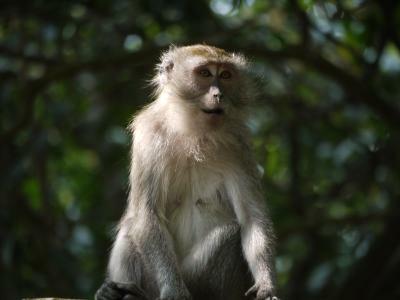 Much of East Java is a series of national parks like Bromo and Ijen, which is the easternmost one. There are lots of Arabica coffee plantations on the way. After arrival, I could just barely see a nearby waterfall before sunset at 17:20. 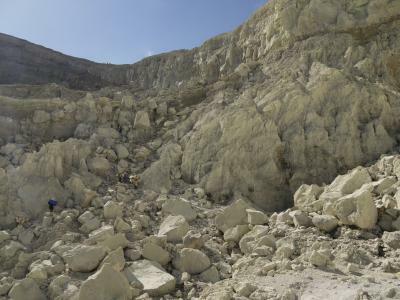 It's three km climbing a steep dirt path up the forested slopes from the minibus parking lot in Ijen to the top of the crater rim of the Ijen volcano. 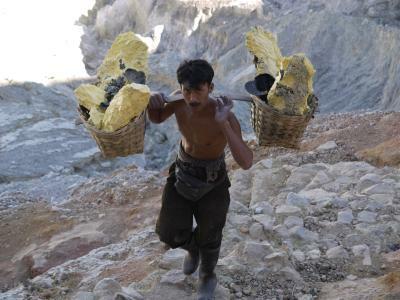 A stream of workers carrying a pole with a basket full of big sulphur bricks at each end over their shoulders. I talked to Suleiman, going back up with empty baskets; he carries as much as 100kg! I tried a 70kg basket and could barely walk straight, but they go up and down the mountain with this load. Many have big scars on their shoulders. 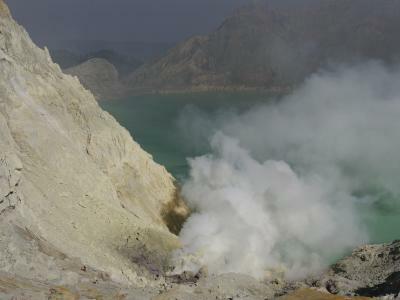 There is a large green lake of hot acid in the crater of the volcano. Near the surface steam comes from crevices at high pressure, carrying sulphur. The crater wall is yellow there all the way to the top. I climbed down the extremely steep rocky trail to a place near the bottom of the crater where I could watch the workers. The trail is barely discernible, just a big rock face where the workers carry they 80-100kg loads up. For me it was hard enough doing it without any load. I saw one guy doing it barefoot, and another whose legs were shaking. 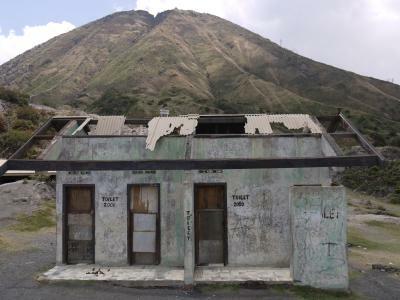 They get 30 kilorupees per load carried up there and down the volcano, about two euro. They do it two or three times a day. Nobody seems to be over 30. From my viewpoint I could see workers hacking the condensating sulphur into big bricks that get loaded into the baskets. 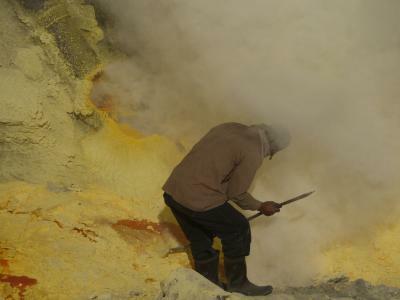 Sulphur is yellow when cooled, and orange when it's still liquid. The steam is poisonous and cannot be breathed, but they stand right where it comes from the ground; I heard a lot of coughing. Eventually I had to run away from a big cloud coming my way; breathing through a scarf doesn't stop the sulphur. If you sometimes don't like your job, imagine doing theirs. The minibus took us to Ketapang harbor, where I caught a ferry. I am now on Bali.